Our parish observes the full and ancient rites of the week of Our Lord’s Passion. On Holy Monday (8:00 a.m.), Holy Tuesday (9:00 a.m.), and Holy Wednesday (10:30 a.m.), the regular daily Mass is celebrated in the Chapel of the Annunciation of Our Lady. The Mass ends with a procession of the Blessed Sacrament to the Altar of Repose. Our Altar of Repose is set in our Annunciation Chapel and the Altar Guild turns it into a beautiful and lush conservatory to remind us of Jesus’ praying in the Garden of Gethsemane. After a brief visit to the garden the parish family gathers in Banner Hall for an Agape Potluck Supper. Turns are taken to sit for an hour at the Altar of Repose. At midnight the Sacrament is reposed and the church closed for the evening. Good Friday is celebrated with the Stations of the Cross prayed at 12:00 p.m. The main Liturgy of the Day begins at 7:00 p.m. in the main church. This Solemn Liturgy consists of the Reading of the Passion, the Ancient Collects, the Veneration of the Cross, and the Mass of the Presanctified. The Liturgy ends in silence and all leave without visiting. Holy Saturday begins with Morning Prayer in the Chapel of the Annunciation at 9:00 a.m. The Altar Guild works all day to make ready the Church for the Great Easter Vigil and First Mass of the Resurrection at 7:00 p.m. Saturday evening. This is the most important liturgy in the life of parish each year. 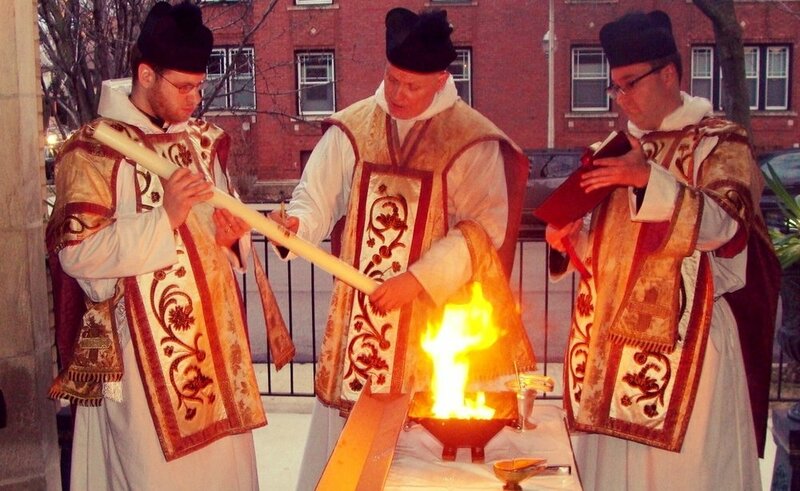 The Liturgy begins at the Narthex doors with the blessing of the new fire & the Pascal Candle. A procession enters the darkened Nave to the deacon chanting “The Light of Christ.” The whole congregation genuflects and responds “Thanks be to God”. The Exsultet is sung and prophecies read. At the beginning of the Mass the lights come as the priest declares, “Alleluia, Christ is risen.” The Gloria in Excelsis is sung with all ringing hand bells. The Baptismal Font is blessed with new Lustral Water and all renew their Baptismal Vows and receive the Asperges. After Mass there is a Parish Resurrection Party with champagne, hard-boiled eggs, and Easter cakes. Click above to watch our 2018 Christmas Eve Midnight Mass. Advent begins Sundays prior to Christmas with Sunday Masses at 8:00 and 10:30 a.m.
Mass on the First Sunday of Advent begins with Decalogue (the Ten Commandments from Exodus 20) said at the 8:00 a.m. Mass, and the Great Litany (an ancient prayer of petition) is sung in procession at the 10:30 a.m. Mass. The Third Sunday in Advent is Rose Sunday, named for the change in liturgical color from violet to rose. Roses are distributed to all of the women in attendance. The Children’s Christmas Pageant will rehearse each Sunday in Advent at 11:30 a.m. in the Christian Education Atrium. The Pageant is presented after the 10:30 a.m. Mass on the Fourth Sunday of Advent and is followed by a St. Nicholas Party.